A young orangutan that had been kept locked in a wooden crate for four years has been rescued by conservationists in Borneo. Indonesian Forestry officials aided in the rescue of the ape after a tip-off from residents at the small village of Punai Jaya. A local man identified as Aliansah admitted he had found the orangutan in the palm oil plantation close to his house in 2015, and had been illegally keeping her as a pet ever since. 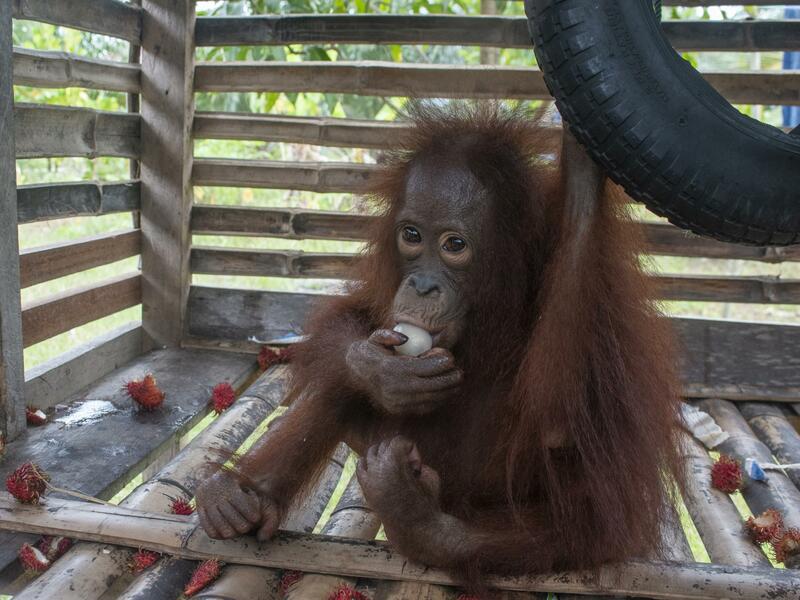 The young female, named Senandung, was kept in a cage no larger than 2m by 1.5m. Her owner claimed he had tried to set her free but she had returned to the house. Initial inspection by a vet suggested the ape was healthy, but was recovering from a cold. Sir David Attenborough has issued a stark warning about climate change to business figures gathered in Davos, telling them that “what we do now…will profoundly affect the next few thousand years”. On the eve of this year’s World Economic Forum, the renowned naturalist told the audience that the worlds of business and politics should “get on with the practical solutions” needed to prevent environmental damage. “As a species we are expert problem solvers. But we’ve not yet applied ourselves to this problem with the focus it requires. “We can create a world with clean air and water, unlimited energy, and fish stocks that will sustain us well into the future. But to do that, we need a plan,” he said. The broadcaster made his speech after receiving a Crystal Award, which is awarded by the forum to “exceptional cultural leaders”. Two decades of research have revealed that 60 per cent of the world’s coffee species face extinction due to the combined threats of deforestation, disease and climate change. The Antarctic ice sheet is losing six times as much ice each year as it was in the 1980s and the pace is accelerating, one of the most comprehensive studies of climate change effects on the continent has shown. More than half an inch has been added to global sea levels since 1979, but if current trends continue it will be responsible for metres more in future, the Nasa-funded study found. The international effort used aerial photos, satellite data and climate models dating back to the 1970s across18 Antarctic regions to get the most complete picture to date on the impacts of the changing climate. It found that between 1979 and 1990 Antarctica lost an average of 40 gigatonnes (40 billion tonnes) of its mass each year. Greater Manchester is to effectively ban fracking, raising the prospect of fresh confrontation with the government over the controversial industry. All of the region’s 10 councils are to implement planning policies which create a “presumption” against drilling for shale gas in their areas, Manchester mayor Andy Burnham has announced. Campaigners said the move was the latest sign that the tide was turning against fracking, which has been the subject of multiple legal battles across the country. Critics of fracking say it poses environmental and health risks. Drilling at the UK’s only operational fracking site, run by Cuadrilla in Lancashire, has repeatedly been halted due to earth tremors. Japan will resume commercial whaling next year for the first time in more than three decades, in a move that has provoked strong criticism from campaigners and the international community. Chief cabinet secretary Yoshihide Suga said his nation would leave the International Whaling Commission (IWC) to resume hunting the marine mammals in Japanese waters. However, he stated the activity would be limited to Japan’s territory and the 200 mile exclusive economic zone along its coasts. Diplomats from around the world have agreed a major climate deal after two weeks of United Nations talks in Poland. But climate campaigners warned the deal – effectively a set of rules for how to govern the 2015 Paris climate accord – agreed between almost 200 countries lacked ambition or a clear promise of enhanced climate action. Activists cautiously welcomed elements of the plan, saying “important progress” had been made on ensuring that efforts to tackle climate change by individual nations can be measured and compared. But environmental groups were also highly critical of the agreement, warning it lacked ambition and clarity on key issues, including financing for climate projects for developing countries. DNA taken from massive shipments of ivory has been used to identify the three largest wildlife trafficking gangs operating at the height of Africa’s elephant poaching epidemic. Ivory tends to be shipped around the world from African ports in bulk, and scientists have used genetic evidence gleaned from intercepted batches to reveal their origins. Led by Dr Samuel Wasser from the University of Washington, they traced a number of these shipments to three cartels operating out of Kenya, Uganda and Togo. Staff at from International Animal Rescue and the Nature Conservation Agency (BKSDA) of West Kalimantan conducted the rescue and took the orangutan to a nearby conservation centre. There she will be kept under quarantine for two months, and tested to ensure she is not carrying any diseases that could be passed onto other orangutans at the centre. Despite considerable campaigning and education programmes, the illegal practice of keeping these endangered creatures as pets still persists in remote parts of Borneo. “It’s time everyone who keeps an orangutan realises that, if they persist in breaking the law, orangutans will become extinct,” said Karmele Sanchez, programme director of International Animal Rescue Indonesia. Orangutans are under threat from deforestation and hunting as palm oil operations expand into their dwindling forest territory. Numbers of these great apes in Borneo have roughly halved over the past two decades, with human operations wiping out up to 90 per cent of their habitats. Normally young orangutans of Senandung’s age would be with their mothers, so the conservation groups said it was highly likely the baby ape’s mother had been killed. Conservation groups operating in the region aim to rehabilitate rescued apes, but said this is often not possible if the former pets are too old to safely return to the wild. In order to give the species a chance, they said something must be done to stop the deforestation that lies at the heart of their decline. Previous articleEarly Feminists Issued a Declaration of Independence. Where Is It Now?